No, not Elton John. More than a century ago, "Master Wallace Wood" in Cleveland, Ohio received this penny postcard from his relative "Elton" in Toledo, Ohio. "Master Wallace" was an inaccurate but common misspelling of my husband's uncle Wallis Walter Wood (1905-1957). The correct spelling is in pencil, below the greeting from "Elton," the sender. Which Elton in the Wood Family? Originally, when I saw this, I thought the sender might be Marion Elton Wood (1867-1947). He was an uncle. A few of the Wood aunts and uncles wrote to their nephew, I know from reading all those post cards. But rereading recently, it dawned on me that this had to be a young person writing, the way Wood first cousins were encouraged (possibly strongly encouraged, as in "you will do this") to send postcards to each other for holidays and birthdays. The handwriting doesn't look like that of a very young person, but probably a teen. So the sender was, I now realize, almost certainly Charles Francis Elton Wood (1891-1951), the son of Marion Elton Wood in Toledo, Ohio. The younger Elton and Wallis Walter Wood were first cousins. They each had many first cousins because their fathers were among 17 siblings. Imagine a lot of penny postal greetings flying through the mails between all these cousins! The younger Elton went by the name "Elton" in the 1910 US Census, where he is shown as as "Elton C.F. Wood." His parents, Marion Elton Wood and Minnie C. Miller, told the Census they had had 2 children in all but only 1 was now living--the younger Elton. By 1940, the younger Elton is listed as "Charles F. Wood" and his occupation in the Census is "shipping foreman." His WWII draft registration card shows him working for a bakery. His name is now listed as "Charles Francis Elton Wood." Unfortunately, Elton died in a car accident 1951. His death cert calls him "Charles Francis Elton Wood" but his obit in the Toledo Blade newspaper calls him "Wood, Elton." The name "Elton" did live on in, as the middle name of one the younger Elton's grandsons. Remember that Sesame Street song, "One of These Things Is Not Like the Other"? Well, one of our immigrant grandparents is not like the others. One was a city girl, the others were all from rural backgrounds. This month's Genealogy Blog Party theme is "Immigrant Ancestors." This week's #52Ancestors prompt is "out of place." I've fit both into one post about his and hers immigrant grandparents. My husband had only one immigrant grandparent. All the others were descended from families that had come to America long ago (some as long ago as the Mayflower). Others arrived in the 1700s. At top, hubby's immigrant Grandma Mary Slatter Wood (1869-1925). Born in the poverty-stricken Whitechapel neighborhood of London, she was the youngest of six children. In her youth, she was in and out of notorious poorhouses because her father wasn't always in the household and her mother (Mary Shehen Slatter) couldn't support the family. Yet Mary not only survived her sad childhood, she became a doting and devoted mother in her 30s after arriving in Ohio and marrying James Edgar Wood (1871-1939). The photo above shows her soon after her marriage, around the turn of the 20th century. From hearing my late father-in-law talk about her, Mary was the bedrock of love for her four sons. Mary was born a city girl and she lived a city life in fast-growing Cleveland, Ohio. My immigrant grandparents, all four of them, were from the country, unlike my husband's big-city grandma. Above, my paternal grandma, Henrietta Mahler, from Latvia. Her husband, Isaac Burk, was from Lithuania, and they met in New York City. Both lived fairly rural lives in Eastern European towns, but had to adjust to skyscrapers and concrete when they arrived in the Big Apple. After some years in Jewish Harlem, they moved to the Bronx--then considered almost suburban because of the many parks, not to mention the world-famous zoo and botanical gardens. My maternal grandparents, shown here, were both from Hungary. Hermina Farkas Schwartz (1886-1964) and Tivador "Teddy" Schwartz (1887-1965) met and married in the Lower East Side of Manhattan. Before coming to New York City, he lived in Ungvar in Hungary, a bustling market town, and she lived out in the countryside in the small town of Berehovo. They raised their three children in an apartment in the Bronx, nothing at all like where they were originally from. After the children were grown and gone, Grandma Minnie and Grandpa Teddy tried to spend a week or two each summer away from the city heat in "the country." I dimly remember visiting them in a bungalow in Spring Valley, New York, which is now a hop, skip, and jump across the busy Tappan Zee Bridge but was then quite a rural area, dotted with small summer rentals. Remember Soundex? Consider Sound AND Spelling! When I began my genealogy journey 21 years ago, I had to learn new vocabulary, such as Soundex. 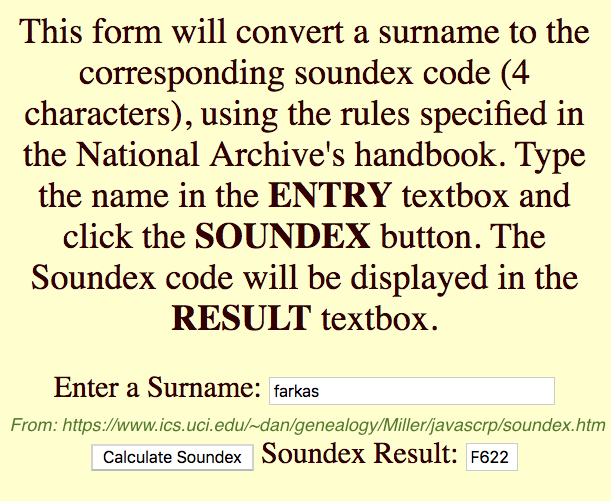 Soundex is a method of classifying a surname based on the way it sounds. The National Archives explains it here. I quickly picked up the basics, and any time I was at the local Family History Center, I could consult the Soundex poster as a refresher. These days you can go to a converter like this and type in the name. Out pops the Soundex code, which consists of a letter and three digits. 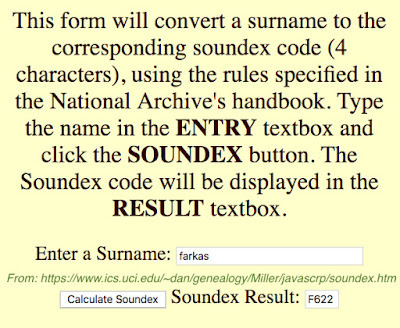 As shown here, my great-grandpa Farkas's Soundex code is F-622. Why care today? Even though indexing and other advances have made genealogy research faster and easier, sometimes the old methodology offers clues to help us find elusive ancestors. Farkas Sounds Like . 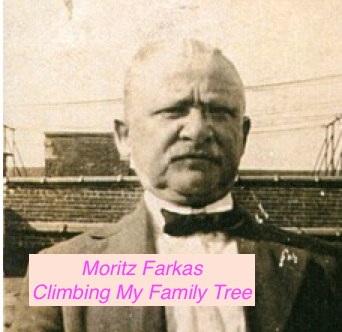 . .
More than 30 years ago, my wonderful Cousin B went looking for our ancestor Moritz Farkas (1857-1936). There was no such thing as an indexed census with full names for every person in every household. She couldn't log into a database, type in a name, and pull up a listing of possible results. No, Cousin B began by looking at microfilmed 3x5 index cards filed by Soundex code, listing those in the 1900 Census. Hand-cranking the microfilm reader, she read every card carefully to try and find Moritz. At top, you can see the index card she eventually found among the F-622 cards for that Census. As soon as she saw it, she said the name "Furkosh" out loud and realized this was the way it would sound in his native Hungarian. Using the cross-reference at top right of the card, she pulled the microfilm for the correct Enumeration District and cranked to the page and line indicated. There was Moritz (as Morris, the Americanized given name), living as a boarder with a family in Manhattan's Lower East Side. When one of my second cousins* recently asked how Cousin B located Moritz Farkas, she sent the 3x5 card (long ago printed from the microfilm) and told us the story. Trying to replicate the search with today's technology on Family Search, I entered basic info (name: Moritz Farkas; birth: 1857; residence: New York, New York in 1900). 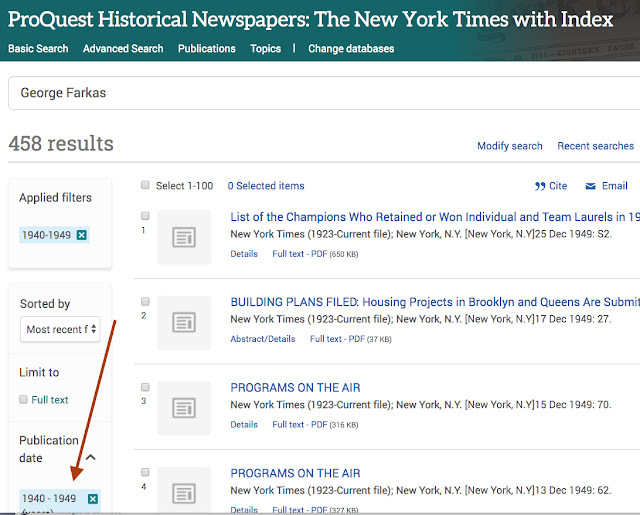 Sure enough, the Morris Furkosh result appeared in the first 10 results, as shown in the snippet here. Clearly, Family Search does a great job of searching on the basis of how a surname sounds, not just spelling. Knowing the sound of the name in Hungarian, I didn't overlook this result, which wasn't spelled like my ancestor's name of Farkas. *This cousin found Moritz Farkas in the census with a different, creative search method. He ignored the surname and searched for Moritz and Morris in the 1900 Manhattan census records, including the birth year, hoping there would not be too many to sort through. When he came to the entry for "Furkosh" he remembered this was the Hungarian sound of the surname and knew he had found our ancestor! 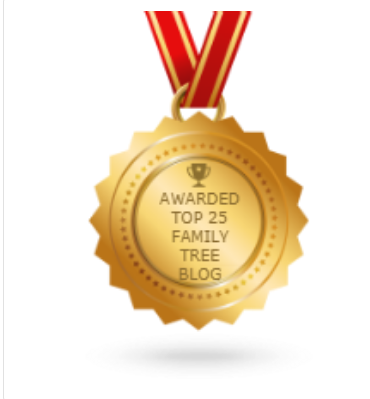 As shown above, my genealogy blog includes tabs for a series of "landing pages," mostly devoted to summarizing what I know about key ancestors in my family tree and hubby's family tree. I established the first of these ancestor landing pages more than 6 years ago, and expanded until now I have 14 such landing pages. Each tells the story, in brief, of an ancestral couple or family. 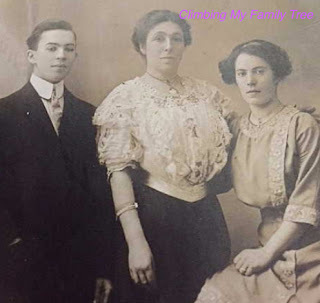 When I blog about one of those ancestors or families, I update the landing page with a link to the newest post. This enables anyone who searches for that surname to see, at a glance, what I've learned about that family and what I'm still learning or wondering about. In addition, I have a landing page devoted to hubby's Mayflower ancestors. The remaining 3 landing pages include links to free genealogy resources, sample templates for family history, and my genealogy presentations. Halbert McClure and family from Donegal. This is the Scots-Irish ancestor of my husband who had enough money to sail, with many members of his family, from the north of Ireland to Philadelphia. The family then walked to Virginia to buy farm land. Robert & Mary Larimer. According to my husband's grandfather, family lore has it that Robert Larimer was sent from the North of Ireland to America to make his way in the world. Alas, he was shipwrecked en route and forced to work off the cost of his rescue. Schwartz family from Ungvar. This is my maternal grandfather's family. Born and raised in what is now Uzhorod, Ukraine, Grandpa Teddy was the first in his family to leave for America. Soon he sent for an older brother and together, they saved their nickels and sent for a baby sister. My landing pages are attracting thousands of views, so I know people are finding them via online search. Sometimes people even leave me a comment or write me c/o my blog to discuss possible family connections. More than once, a cousin I didn't know I had (or couldn't find) has landed on my blog and gotten in touch with me. Genealogy blogs are excellent cousin bait, and ancestor landing pages increase the odds of being found via online searches. MyHeritage profile is temporarily empty, soon to be filled! 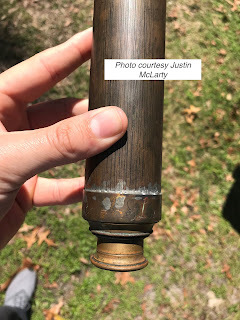 This week's #52Ancestors prompt is DNA. For years, my main genealogy site has been Ancestry, in part because of the size of its DNA base and because my multiple, ever-growing family trees are all housed there. Thousands of ancestors, counting his and her trees, some with thousands of hints to be examined. My DNA and hubby's DNA also appear on Gedmatch, because of the tools available for analysis and because we can fish for matches among all people using that site, regardless of where they originally tested. I created a basic tree for him and for me on Gedmatch, and also listed major surnames so people browsing matches can quickly see how we might match, as cousin bait. Now I admit, I'm often frustrated by how many Ancestry DNA matches have no family tree, or only a few names, or a private tree only. So now that I just subscribed to MyHeritage, to more intensively research my husband's British, Irish, and Scottish ancestry, I'm transferring my DNA and hubby's DNA there too. Since I sync my Ancestry trees with my RootsMagic 7 software, I will be able to upload an updated Gedcom tree for myself and my hubby onto MyHeritage with little effort. 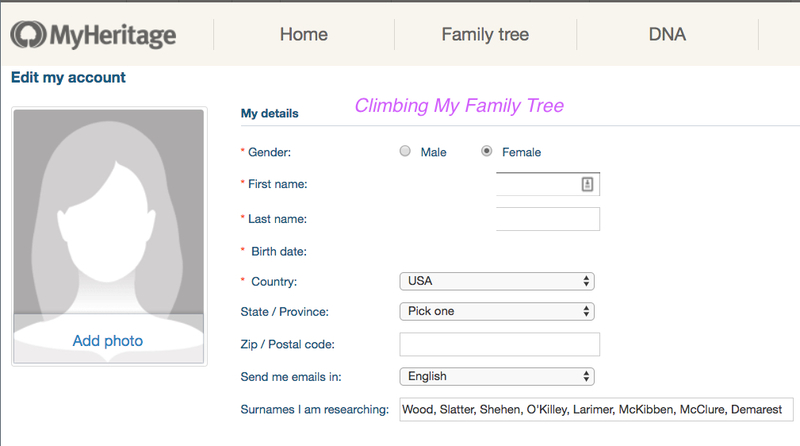 Thanks to the RootsMagic Users group on Facebook, I learned how to export a Gedcom with living people marked as private. Now I can take advantage of both Ancestry and MyHeritage hints through RootsMagic, as shown here. Make it easy for DNA matches to see the family tree(s), and we just might get better answers to our notes or possibly hear from matches who take the initiative to reach out to us! Cousin bait. My husband is a descendant of Mayflower ancestors Isaac Allerton, his wife Mary Norris Allerton, their daughter Mary Allerton, and Degory Priest. 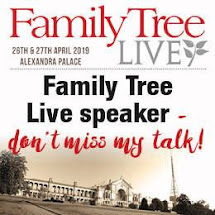 Through the detailed research of the Wood cousin who's been doing genealogy for more than three decades, we are now getting acquainted with a fifth Mayflower ancestor, Francis Cooke. Little by little, I'm reviewing the names/dates of the begats and adding all the intermediate ancestor links to the Wood family tree. Francis Cooke died in Plymouth colony 356 years ago today. William Bradford reportedly wrote a decade before Cooke's death: "Francis Cooke is still living, a very old man, and hath seen his children's children have children." By one estimate, Cooke was about 80 when he died on April 7, 1663. Mary Cooke married John Thomson (or Tomson/Thompson). Their daughter Mary Thomson was the second wife of Thomas B. Taber. Their son Joseph Taber married Elizabeth Spooner. Their son William Taber married Mary Wing. Their son Nicholas Taber married Desire Vincent. Their daughter Harriet Taber married Isaiah Wood Sr. Their son Thomas Haskell Wood is my husband's great-granddaddy! So if my fingers and toes have counted correctly, Francis Cooke is my husband's 8th great-granddaddy. The Francis Cooke Society keeps his memory alive and helps descendants prove their Mayflower connection to him. My great uncle Meyer Berg (1883-1981), left his home in Gargzdai, Lithuania in the spring of 1903 and sailed from Rotterdam to New York City on the S.S. Ryndam, shown above in 1919. Also known as the S.S. Rinjdam, this Holland-America ship launched in 1901, equipped to carry a few hundred first-class passengers, a few hundred second-class passengers, and 1,800 third-class passengers. 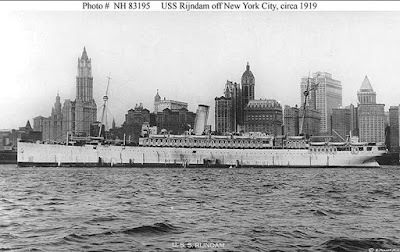 The S.S. Ryndam had a varied career, serving in trans-Atlantic transport convoys during WWI before returning to mercantile shipping until it was scrapped in 1929. The May 16, 1903 crossing of the S.S. Ryndam from Rotterdam to New York City included my great uncle Meyer. According to the manifest, his passage to America was paid by his sister, who picked him up at Ellis Island. It has to be his older sister Nellie Block, since she was the only sister in New York at the time. In 1906, Meyer's younger brother Max (Matel) Berk sailed from the same port, on the same ship, arriving on July 9th. Max was picked up by his brother (my future paternal Grandpa) Isaac Burk, who also paid for his passage, according to the manifest. It makes me feel good to read these notations showing how family helped family to build a better future by coming to America, one or two siblings at a time. Notice from the map that Gargzdai is close to the Baltic Sea, at the far Western end of Lithuania. 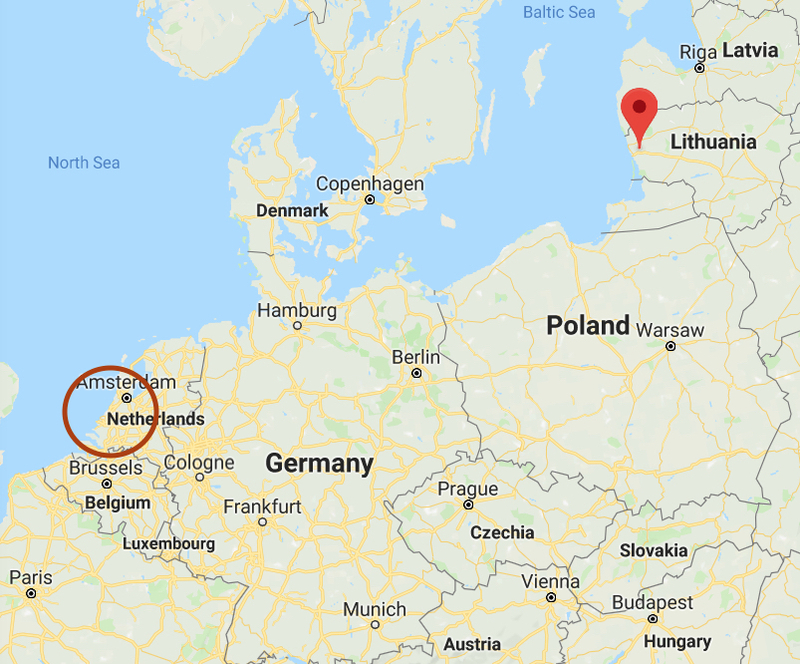 Meanwhile, Rotterdam is quite a distance southwest (see circle). Yet these two immigrant ancestors, both brothers of my paternal Grandpa, choose Rotterdam as their port of departure. On the other hand, Hamburg was the port of choice for Max and Meyer's brother-in-law. 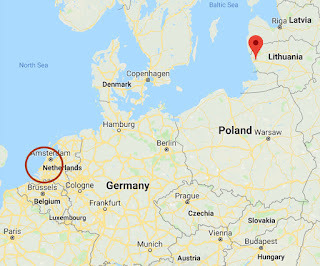 Their sister, Jennie Birk (1890-1972), married Paul Salkowitz (1889-1957), a man born in Memel, in the Klaipėda Region that has been both Lithuania and Germany. Paul sailed from Hamburg in August, 1911. Hamburg, not Rotterdam. I keep thinking about these port choices, in the context of the steamship lines' marketing to potential immigrants in Europe, as well as whether these immigrants left their hometowns legally. Always something to think about with #genealogy! Was John Shehen a Bricklayer? I keep saying I married my husband for his ancestors, an endless source of genealogical challenge and fun. For this week's #52Ancestors ("brick wall" is the theme), I'm looking at my husband's great-great-grandfather, John Shehen (1801-1875? ), who lived much of his adult life in a terribly poor section of London. When his daughter Mary Shehen (1837-1889) married John Slatter (1838-1901) in London in 1859, she told UK authorities that her father was a bricklayer. You can see that in the marriage document at top. Well...not so fast. John and his wife Mary were both born in Ireland, they consistently told the UK Census (see this snippet from the 1841 Census, where the "I" stands for Ireland). John (but not his wife) was consistent about his age in the UK Census, saying he was 40 (in 1841), 50 (in 1851), 60 (in 1861), and 70 (in 1871). He lived in the same impoverished area of Whitechapel, London, all those years. John was also consistent about telling the UK Census that he was a labourer. His wife was either a laundress or milkwoman, but he said he was a labourer. Although he may very well have worked in construction, even worked with bricks, he didn't call himself a bricklayer even once. I need to investigate whether there are any guilds or unions that John Shehen might have belonged to in the London area. Meanwhile, I'm inclined to think his daughter Mary was exaggerating his status just a bit on the official marriage record. Alas, marriage records didn't ask for the mother's maiden name, so I'm out of luck at this time. Where in Ireland were John Shehen and wife Mary from? I have no idea, since the UK Census only lists "Ireland" as their birthplace. The spelling of his surname varies from time to time, and I make my own life simple by calling him "Shehen" here and on Ancestry, aware that creative spelling is needed when conducting research. He's gone from the 1881 Census, and I think I found his death from bronchitis in 1875. The name on that form is Shehan. But not enough details to know for sure. What about John's wife, Mary? She was actually counted by the UK census twice in 1871. I found her admitted to Northumberland Workhouse due to "chronic rheumatism" in March, and released exactly one month later. Her age was shown as 70. Despite being in the medical ward of the workhouse at the time of the Census on 2 April 1871, she was also shown as living at home. I don't know when or where Mary Shehen died, unfortunately. I may have found her in the 1881 Census, but I'm not sure whether to hope it's her or not. A "Mary Sheen" born in Ireland was enumerated in the District Middlesex Lunatic Insane Asylum in 1881. Shown as age 77, this Mary has the occupation of "charwoman." Also, Ancestry shows a number of people with Mary's given name but varying spellings of the "Shehen" surname as being imprisoned, acquitted, and/or in London court registers for different offenses such as theft, from the 1830s on. Was this my husband's great-great-grandma? The dates are in between the Census, so I can't know for sure, but my guess is no. Why? Because Mary and John remained in their same lodgings for so many decades, I suspect they had just enough financial stability for Mary to not resort to theft. Or so I hope. Center, Nellie Block. Right, Jennie Birk. Left: Which brother? My great aunt Nellie Block was the oldest sister of paternal Grandpa Isaac Burk. She's the lady in the center of this undated photo. From the meager paperwork I've assembled, she may possibly have come to America from their hometown of Gargzdai, Lithuania, before her other siblings made the journey. I haven't yet found her on a passenger manifest, so I can't confirm exactly when she crossed the Atlantic. She didn't travel with her brother Meyer Berg, who arrived in May, 1903, or her brother Max Birk, who arrived in 1906. She didn't travel with my Grandpa Isaac or his older brother Abraham, who both went to Canada first. She didn't travel with younger sister Jennie, who arrived in 1909. In each case, I found these siblings on the manifest without her, seeming to be alone in their trans-Atlantic crossing. Nellie Block's gravestone shows her Hebrew name as "Neshi, daughter of Solomon." (This tallies with what I know of the father's name.) It also shows her as 85 years of age when she died. Date carved in stone? Not necessarily correct. I am actively searching for her in the 1915 NY Census, 1920 US Census, 1930 Census, or 1940 Census, using variations on her name, because I am 99% positive she remained in New York City. Based on what I have in hand, I believe she was born in 1879 and was actually 71 (not 85) when she died on December 22, 1950. Why the family would have her age as 85 is a mystery. 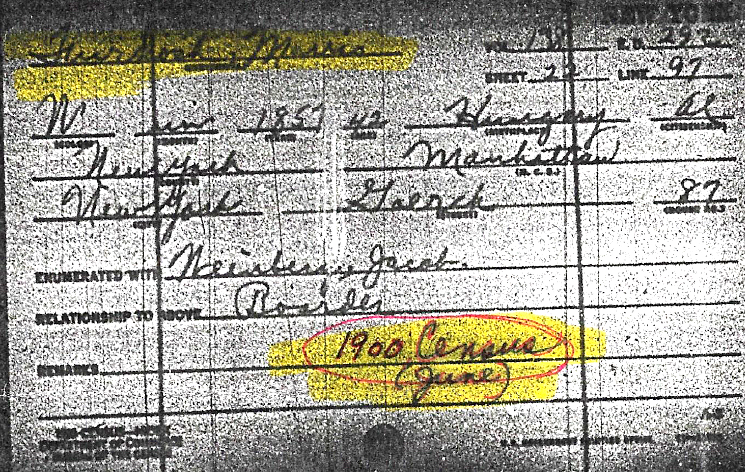 Two Census documents show Nellie lived as a boarder in tenements on the Lower East Side of Manhattan, where so many other immigrants began their new lives. Her address in 1905 was 62 Henry Street, a tenement building that no longer exists, where she was a boarder in someone else's apartment. 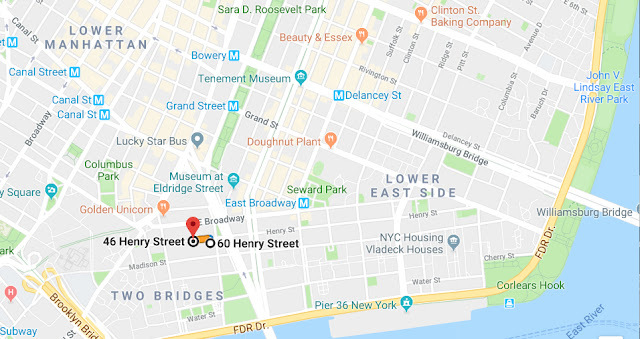 Her address in 1910 was 46 Henry Street, boarding in a tenement just a one-minute walk from her previous address, as shown in the map above. That area has been going through a resurgence; I found an article here about what Henry Street used to be like a century ago. Oh Henry! was the name of a popular candy bar introduced about 100 years ago and still on the market today. Whether Nellie ever tasted one, I have no idea. It would be so sweet to learn more about Great Aunt Nellie! My paternal grandfather, Isaac Burk (1882-1943), was born in Gargzdai, Lithuania, and had at least five siblings. Based on old photos in the family, there was probably a much younger brother who remained in Lithuania when Isaac and his siblings Max, Jennie, Meyer, and Nellie came to America and older brother Abraham came to Canada. As part of my genealogy go-over, I'm reviewing the holes in their stories and doing more research to fill in. Today, I'm looking at Max (originally Matel) Birk (1892-1953), the youngest of siblings who left Lithuania. Grandpa Isaac (who died long before I was born) spelled his surname Burk. The other siblings went by variations: Abraham went by Burke or Berk, Max went by Birk, Meyer went by Berg, Nellie went by Block, and Jennie went by Birk. No wonder genealogists go a little batty. Yes, I know these fit the Soundex category for Burk, but I also have to spell creatively where Soundex isn't an option. The July, 1906 passenger list for the S.S. Ryndam out of Rotterdam shows Max being met by his brother Isaac Burk (my grandpa) in New York City. That's where the paper trail evaporates for a while. 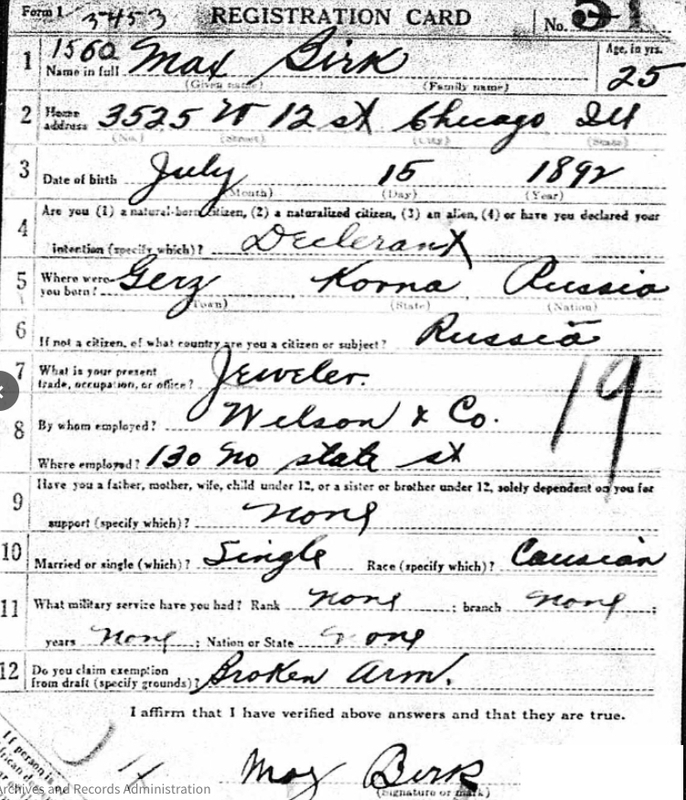 I already found Max's WWI draft registration form, shown at top. He was a jeweler in Chicago in 1917, living at 3525 W. 12 St. He was naturalized in Chicago in 1923, I know from his naturalization papers, and then living at 3525 Roosevelt Dr. But when did Max arrive in Chicago? When did he return to New York City, where he was married in 1936? The search is on for the missing years. So far, no luck finding Max in New York City directories, but that's another avenue I'll pursue shortly. After no luck finding Max/Matel in the US Census for 1910 and 1920 (in Family Search and in Ancestry, plus Heritage Quest as well), I struck out looking for Max in the 1905 and 1915 New York State Census. These searches were via indexing, so shortly I'll try browsing the Census near where his siblings lived in NYC during those Census periods. He may have been mis-indexed and only by browsing will I find him, if he's in NY. Heritage Quest has lots of city directories, but not from Chicago. That's why I used my Connecticut State Library card for remote access to Fold3 for free, from home, to look at Chicago city directories for the early 1900s. I found Max in the 1923 Chicago directory, a jeweler, right where he should be in the listings for Birk (see below), at the same address as on his naturalization papers. He's not in the 1915-6-7 Chicago directories, however. I'm still looking in the Chicago directories via Ancestry for a variation on Max's surname. 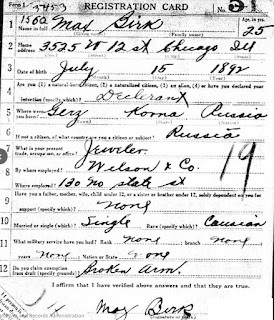 Max was living in Chicago in 1920, at 2525 W. 12th Street, according to his naturalization papers. My next step is to browse the 1920 census for Chicago in that area, and to look for additional Chicago directories from the 1920s to see when he stops appearing. UPDATE: Browsing Census images on HeritageQuest is going to take time, since the address could be in one of several wards. I made a note of EDs and wards so I can stop and pick up in the same place along the way. With My Library Card, Finding Out "Who's in the Paper"
Most of my mother's Farkas family lived in and around New York City from the early 1900s to the 1980s (and for some, beyond). For them, the New York Times was the "paper of record" for key family events announced via paid notices. In particular, it was a way to let relatives and friends know when and where a funeral would be held, via a paid death notice. This week's #52Ancestors prompt by Amy Johnson Crow motivated me to finish searching for the death notices of my Farkas great aunts and great uncles. As it happened, none of the family deaths occurred during the big multi-paper New York City strike, December 1962-March 1963, or the later Times strike of 1965. My parents were accustomed to buying at least two papers a day (morning and evening) and a third on Sunday for the color comics (remember Dondi? ), so they really felt the loss of printed news and paid notices. Happily for me, I can search the New York Times for free, from home, with my local library card, to gather those paid notices. How? Here in Connecticut, a local library card allows me to access databases, like ProQuest newspapers and HeritageQuest, through the Connecticut State Library. And no more microfilm! As shown above, I entered the name of my ancestor in the search box and narrowed the period to be searched to the 1940s. Even though I know his exact death date, death notices might be printed on that day or a day or two later. I didn't want to restrict my search too much. Then I selected the sort for "most recent" articles to be presented first, since he died in the late 1940s. After only a few clicks, I had his paid death notice. Repeating the process, I quickly found the paid death notices of a handful of his other siblings. I used these to verify the date of burial, as well. As shown at right, in some cases the paid death notices included a tribute from an employer or a trade association. 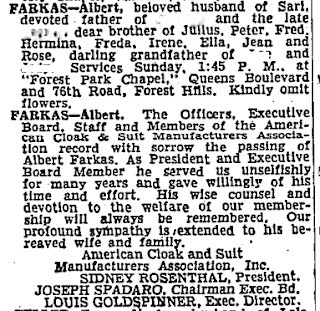 Here, my great uncle Albert was being remembered by the American Cloak and Suit Manufacturers Assn, which he had served as President and as an executive board member. Although I was aware of Albert's occupation, from family stories and from documents like Census records and draft cards, I would never have known about his work for the industry without this extra notice in the newspaper. Farkas Family Tree Says: Go Fish! My mother's Farkas Family Tree loved planning outings for the whole family. I know this because I am lucky enough to have 30+ years of monthly minutes from their meetings. Also, even though I was just a tyke, I have memories of going on a number of these outings years after the traditions began. Formed in 1933 to keep the bonds strong between the eleven adult children (and many grandchildren) of Moritz Farkas and Leni Kunstler Farkas, the Farkas Family Tree began a new tradition in 1938 when one of the members suggested that a fishing trip be held on June 19th. Faster than you can say flounder, the boat was chartered, to carry 50 passengers for a grand total of $50. The next set of minutes, on September 12, 1938, reported: "Our June fishing trip had been a huge success and all who attended requested an encore." Building on the momentum from the first year, the Family Tree decided to hold a second fishing trip on June 4, 1939. The minutes from one week later say it was "a wet success. A number of people disappointed us, owing to weather and illnesses. We were indebted for $50. The expenses came to $68, and collections amounted to $56." The tree association made up the difference. During World War II, gas shortages and tire shortages forced the tree to suspend many of its annual outings, not just the fishing trip but also some summer picnics and/or summer beach trips. The Entertainment Committee, charged with arranging fishing trips, reported in May, 1946, that no fishing was possible that year because boats were not available. A summer picnic was arranged, however. Skipping ahead to 1949, the minutes of June 5th report "on a most successful fishing trip...Many fish and many kinds of fish were caught" not to mention all the eating and drinking on the boat. Dozens of fish were fried at a member's house that evening and "those who didn't realize how tired they were played gin [rummy] until midnight." The minutes even note who caught the first fish, who caught the most fish, who caught the largest fish, and who caught the first flounder. Sis and I went on several family fishing trips during the late 1950s and early 1960s. My father (Harold Burk) was brought up in the heart of New York City, and he loved these outings for the opportunity to feel the wind on the water. He was delighted to introduce his little girls to fishing, using a hook knotted onto a nylon line. I remember catching a flounder using one of these hand-held fishing lines and being so excited I could hardly wait for Dad to pull it up for me. Sis actually caught more fish than I did, but we both had a fun time. Being a picky eater, I wouldn't even taste the flounder we caught when they were cooked up later. Some kids just don't know what's good! As the tree meetings became fewer and farther between, so did the fishing trips. The last report of a fishing trip was in the Historian's Report of 1964, which was "successful both in the number of people who attended and the number of fish so skillfully wrested from the deep." That was the end of a popular tradition. 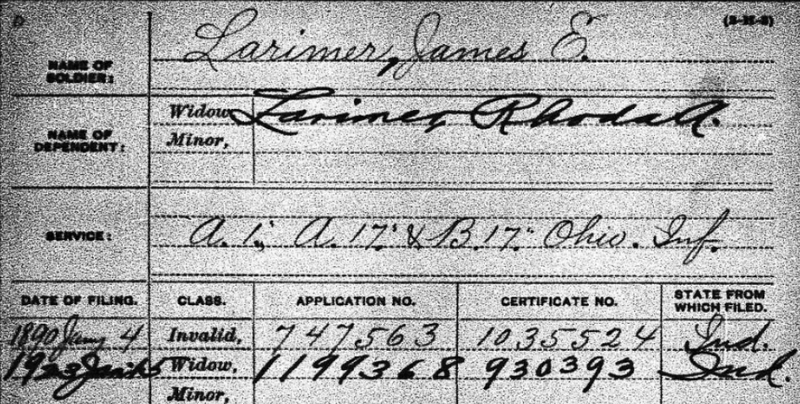 James Elmer Larimer (b. 1840 in Pennsylvania, d. 1923 in Elkhart, Indiana) was my husband's first cousin, 4x removed. James's father died at age 40, having been accidentally thrown from a horse. His mother later left Indiana to go with her brother to gold-rush California, and never returned east. She fretted about leaving her children behind, but was determined to pioneer in California with her family. James was a child at the time, and he didn't join his mother. His siblings went west to California after they were grown, but not James. Just months after the start of the Civil War, he enlisted in the Union Army. 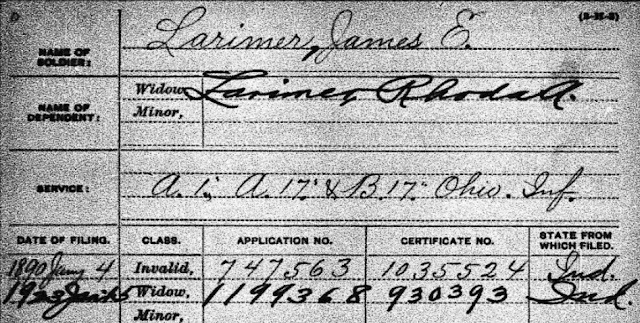 Thanks to documents such as his pension record, I can see James enlisted in Company A, Ohio 17th Infantry Regiment, on 13 Aug 1861. He was 21 years of age, and had no way of knowing that he would remain in the Union Army (with different units and at different ranks) until just after the war ended, in the spring of 1865. Not long ago, I heard from a collector who was researching the name engraved on a Civil War-era telescope: J.E. Larimer. 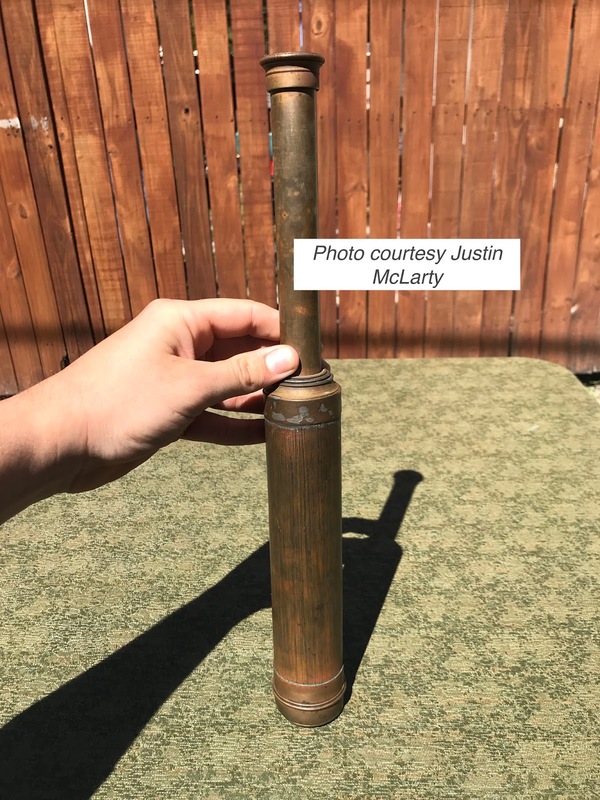 From the engraving, it appears to be the telescope used by my hubby's cousin, James E. Larimer! At top, a view of the telescope when extended for use. 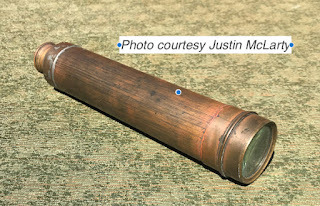 Below, the telescope retracted. At right, part of the engraving, which also mentions the 17th Regiment, Larimer's unit. Thanks to Justin McLarty for these photos of the telescope, which is now more than 150 years old. 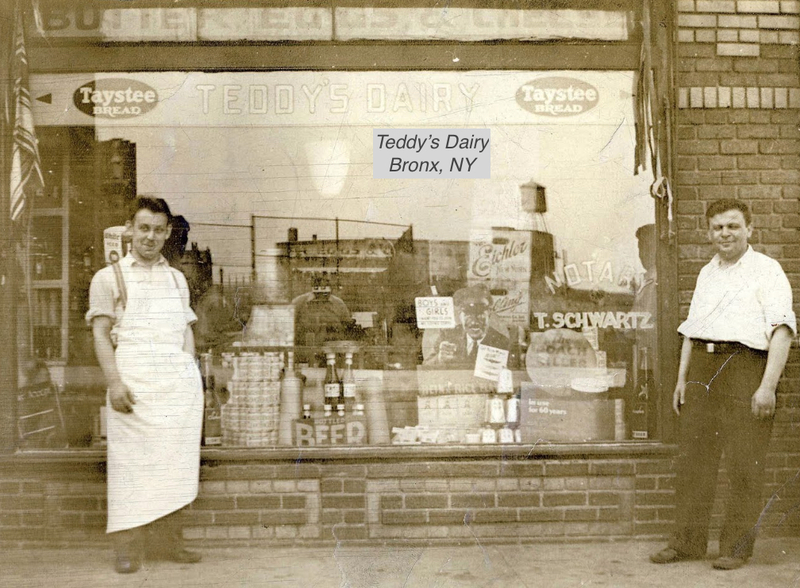 From about 1917 until the late 1940s, my maternal Grandpa Tivador Theodore Schwartz (1887-1965) and maternal Grandma Hermina Farkas Schwartz (1886-1964) owned one small dairy grocery store after another in the Bronx, New York. They would operate a store for a number of years, sell it, and buy or open another in a busier or more convenient neighborhood. It was not an easy way to make a living, keeping the store open early and late, even on weekends, to accommodate local shoppers. 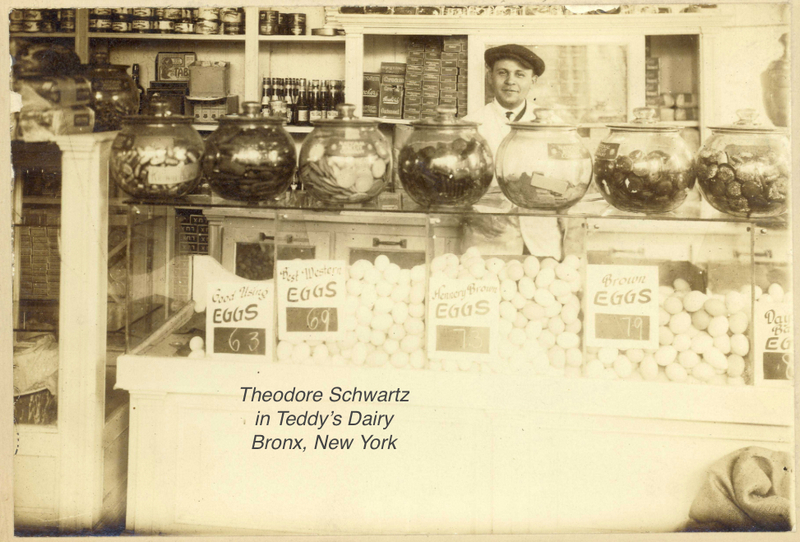 Teddy's Dairy sold at least five different types of eggs in 1934, ranging in price from 63 cents for "good using eggs" to 79 cents for "brown eggs." Apparently "hennery brown eggs" at 73 cents were different from and less desirable (meaning cheaper) than the more generic-sounding "brown eggs." Assuming eggs were priced by the dozen, the "hennery brown eggs" that sold for 73 cents in 1934 (85 years ago) would cost $13.89 in 2019! Try the inflation calculator for yourself here. At right, the outside of Teddy's Dairy, circa 1934. Grandpa is standing at the right, near his name on the window, "Notary: T. Schwartz." The store was still in this location in 1940. Standing on the other side of the display window is Grandpa's long-time assistant, John. According to family legend, John called the store "a gold mine" and eventually bought the business from my grandparents. Once they retired from retailing, Grandpa and Grandma went on a much-delayed honeymoon. Married in 1911, parents by 1912, parents again in 1919, they finally got to Florida to relax and recuperate from selling eggs more than 35 years after their small family wedding. Thanks to Amy Johnson Crow for the #52Ancestors prompt of "12." If you're lucky, a family member has one or two or, say, two dozen photo CDs. You know, the kind you got in the "old" days when you brought photographic film into the local store to be developed and pick up prints, along with a CD of the images, digitally ready for viewing. The old CDs actually had software that ran the photos as a show. That was then. This is now: Who has a CD reader built into a PC or Mac any more? Time to retrieve those digital photos before the CDs are unreadable. Happily for me, Sis has saved all these old photo CDs from the turn of the century up through 2010 or so, when she ditched her film camera for digital. So rather than having to scan snapshots, I took each CD and put it in my external CD drive, hooked up to my Mac. Copied each one, which takes less than 90 seconds, and named it according to what I saw on the images. You know what else is great about these CDs? Don't need no stinkin' negatives when I have high-quality images directly from the developer! 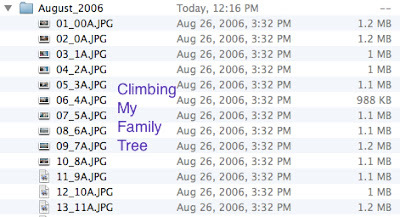 Name and Date That File! Each image on each CD has a number and date attached by the developer (see at right for one example). So as I cleaned images up, I added the month and year to each new image name. Admittedly, not every photo is worth cleaning up and saving. In fact, I usually cleaned up only 6 or so out of 24 (or 36) images on a CD. I didn't delete any of the other images! I just opened and fixed the few photos from each CD that showed recognizable people, or something else meaningful. I cropped, lightened or darkened, straightened, and otherwise tinkered with the best images from each CD, leaving the original exactly as it came off the CD. 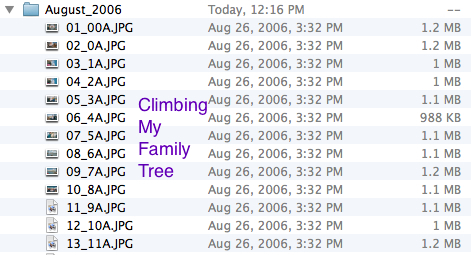 Then I renamed the cleaned-up images with the names of people in them (such as "Marian_Halloween_2009"). I'm not waiting until I look at every single image on every single CD. After cherry-picking the best 6 or so from 4 different CDs, I emailed those cleaned-up versions to family members now. Later, I'll put all on flash drives to send to relatives. But why make them wait? They're happy to see faces from the past. Me too. As I open and check more images from more CDs, relatives will be surprised to see the past in their inboxes. The more people who have these images, the more who can pass those images along to the next generation and beyond. 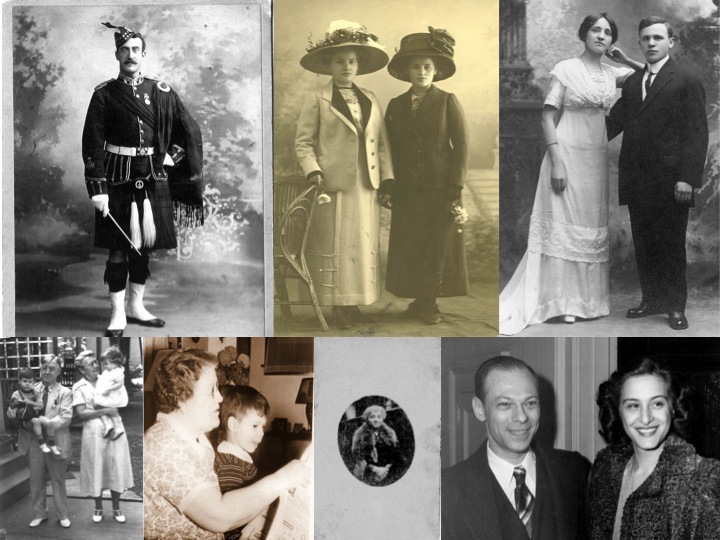 Sharing family photos, stories, and other details is a great way to not only interest relatives in genealogy but also keep family history "in the family" for future generations. For more ideas on safeguarding family history, please take a look at my book, Planning a Future for Your Family's Past. My genealogy research - Are we related? Born in the Bronx but transplanted to New England, I've been tracing my family tree for over 20 years. 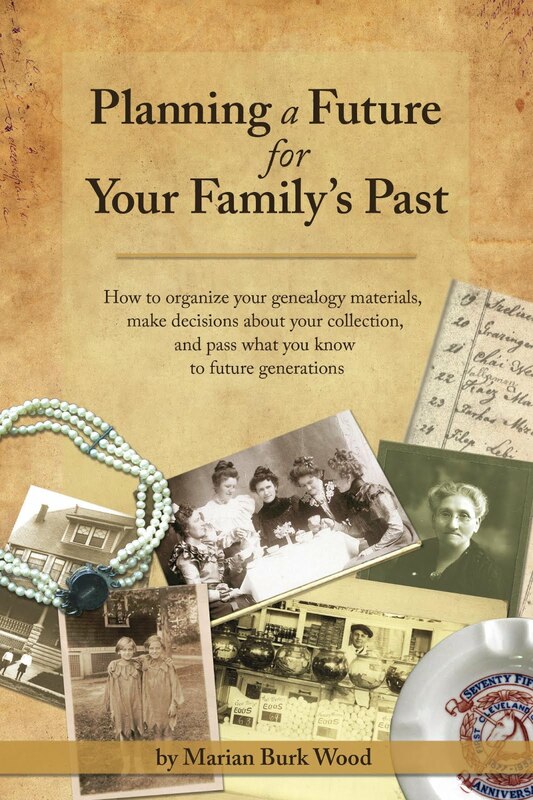 My genealogy book is: "Planning a Future for Your Family's Past" (also one of my presentation topics). Without our ancestors, we wouldn't be here--so it's important to honor their memory by preserving and sharing family history. Visit M's profile on Pinterest. 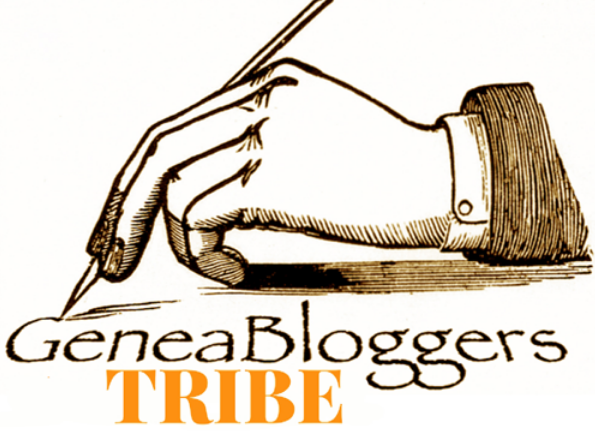 Blog content (c) Copyright by Marian B. Wood, all rights reserved. Ethereal theme. Powered by Blogger.